With the last two films succeeding on a major scale, can Superman III sustain the magic and momentum? Superman III follows Clark Kent back to his hometown Smallville while a dangerous businessman exploits a computer programming genius to cause mayhem to the world. On his return Superman is attacked using an unusual piece of Kryptonite which causes a devastating reaction. 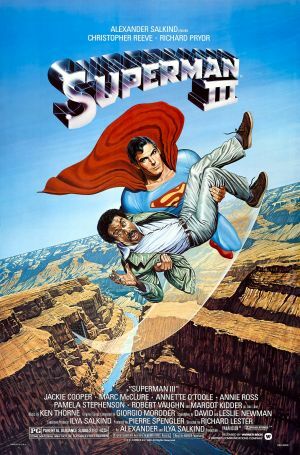 From the onset, Superman III steps away from the previous films with its farcical opening pushing light hearted comedy. A blind man being guided by a yellow-paint road marker and a mime slipping on balls seem to be a huge deviation from what Superman should be: an incredible man saving lives. Richard Pryor plays Gus Gorman, a programming genius, and as expected he brings a great deal of comedy to the franchise. Pryor is excellent in his lead role; the scene when he is drunk with a security guard is surely Pryor gold. However for audiences who thought they were watching a true Superman film, the switch in emphasis to comedy first and foremost and a Superman film second could prove confusing. When not focusing on Pryor, the film follows Clark Kent visiting his past and also an evil version of Superman. By excluding Superman as the shining beacon of hope for America, the film becomes less entertaining, as although it’s interesting to see Superman as a villain, he is more an unknowing henchman to the real villains while this darker side to Superman clashes completely with the now established comedy set-up. What’s more, the fight between Clark Kent and this version of Superman lacks the action and vitality of the previous films. There are no explosions, rockets or cars being thrown, instead we get a disposal site and Superman being covered in car tyres. Unfortunately there are many special effects disappointments with one of the worst offenders being visible strings when Superman takes off – an unforgivable error. Superman III captures some of the magic from its predecessors but largely falls down due to both its relentless comedy angle and not enough of the title character.